Now that we got pretty much what was expected from the Fed (except maybe extending the rate guidance to 2015), the markets turn to the ECB. If the "fix" is unavailable from one dealer the addicts turn to the other. 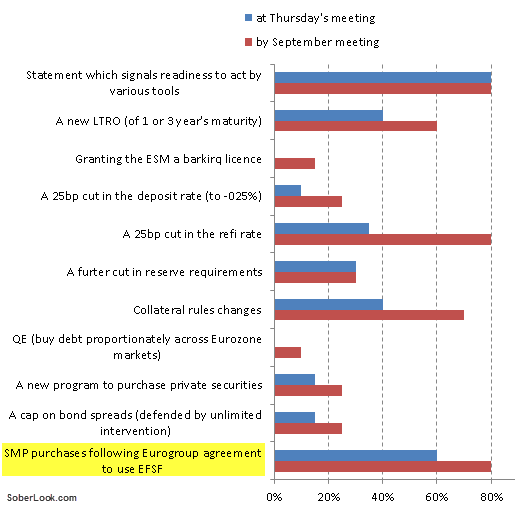 Barclays Capital assigned probabilities to the possible actions by the ECB that could be announced on Thursday as well as at the following meeting in September. Let's quickly go through each of these (with links to further discussion). 1. "Readiness to act" is very likely and the easiest thing for a central bank to say. The Fed just made a similar statement as well. 2. A new long-term LTRO program is quite possible but given the latest collateral restrictions on banks' own bonds (see document at the bottom of this post), it won't have the impact on sovereign debt it did in the past. 3. Granting the ESM a banking license would be quite powerful but lacks the necessary political support. 4. A cut in deposit rate to negative levels will further disrupt money market functioning, sending repo rates and German yields deeper into negative territory. But it may help reduce Italy's and Spain's very short term (only) rates. 5. A cut in refi rate is likely and will be helpful for banks in reducing interest expenses. But as discussed earlier the constraints are not driven by funding costs but by availability of eligible collateral. 6. The reserve requirement was cut late last year from 2% to 1%, releasing €100bn. Cutting it to 50bp will release say €50bn more across all of the Eurozone. We are at the point of diminishing returns. 7. Barclays assigns a relatively high probability to collateral rule changes. Accepting pools of whole loans as collateral could be the only helpful change. But pledging unrated loans in unsecuritized form is nearly impossible because perfecting security interest without being a lender is legally tricky. Anything that can be securitized and rated as acceptable for the ECB has been pretty much used up. Spain is trying to pool export finance into securities and there are other efforts under way. But it's not clear how much "blood can be squeezed from this stone". 8. QE across the Eurozone would involve purchases of sovereign debt in proportion to countries' GDP. That means the ECB would be buying a great deal of German and French debt, which is not where help is needed. Allocating purchases by total debt outstanding would help Italy, but creates a moral hazard - the more debt you have outstanding the more the ECB would need to buy. Pro rata QE is pretty much out of the question. 9. Buying private securities is unlikely, but the Eurozone could definitely benefit from an ABS program like TALF. That would help provide loans where they are most needed - households and small businesses. In effect the ECB is already doing it by accepting securitized loans as collateral. 10. Capping bond spreads on periphery bonds idea has been floating around for a while. The danger with this program would be that by the time some sovereign spreads are brought to a certain level, the ECB may end up owning all of the outstanding bonds. This is a highly unlikely outcome. 11. Periphery bond purchases by the ECB (SMP) sterilized by term deposits is really what the market is now betting on - all based on Draghi's statement. But it's not clear just how much buy-in there is from his colleagues. If this expectation doesn't materialize, we are going to have a violent selloff across risk assets.